Location/ Directions: I-77 to Exit #22A Main/Broadway. Left on Broadway. 1.2 miles. The Quaker Square Inn at The University of Akron hotel is on the right. 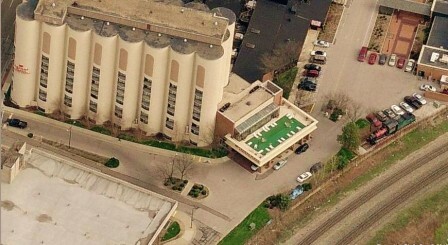 About Hotel: 9-Floors (*Floors 4 to 9 are dorm rooms for the University of Akron), 64-Rooms, Building is a former Quaker Oats grain silo converted into a hotel. Interior Corridors, Balcony, Blackout drapes, Cable/satellite TV, Television, CD player, Clock radio, Coffee, Complimentary newspaper, Desk, Hair dryer, Housekeeping, Complimentary Wireless High-speed Internet access, Iron/ironing board, Refrigerator (on request), Roll-away beds, Sofa bed, Voice mail, Breakfast (complimentary), Business center, Fitness center, Free newspapers in lobby, Front desk (24-hour), Gift shop, Smoke-free property, Wake-up calls, Self-parking (complimentary). Pets allowed (no charge). Railroad View: Excellent View. Most rooms in this motel will have a railroad view...as long as the room doesn't face South Broadway. Railroads past Hotel: ? (CSX and / or Cuyahoga Scenic Railway). Notes: This is the former Crowne Plaza Hotel, originally a Hilton. Word has it this hotel is owned by the University of Akron, and staffed by the students. [This info came from TripAdvisor.com]. Photo Comment: The grain silo looking building to the upper left side of the photo is the motel. The railroad can be seen to the lower right hand of the picture. Note the outdoor pool & deck area offers a great view of the railroad.